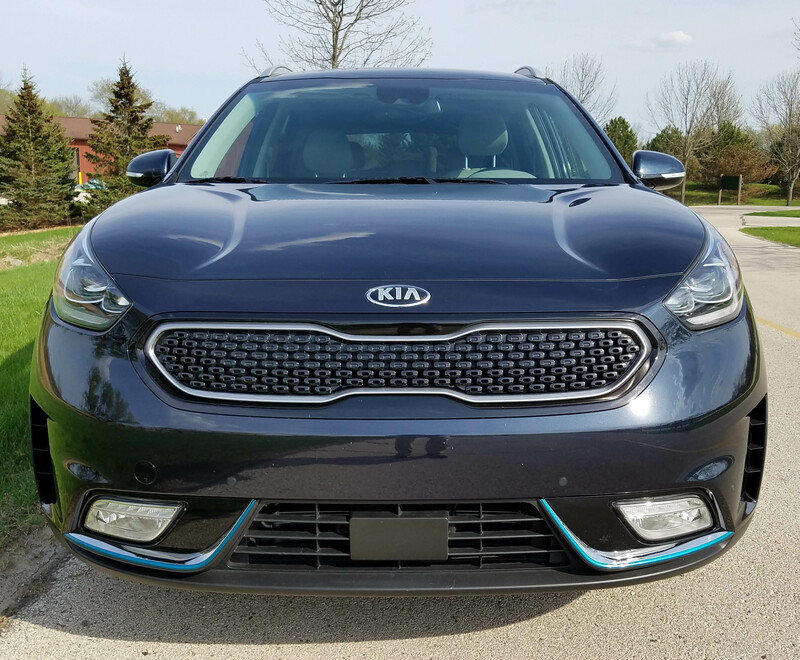 Last year Kia’s Niro hybrid crossover wannabe surprised me big time. It’s attractive, handles well, has decent power and achieved good gas mileage because it was a standard hybrid. Sure the Toyota Prius is queen of this category, but Niro has it all on looks and thoughtfully designed interior. 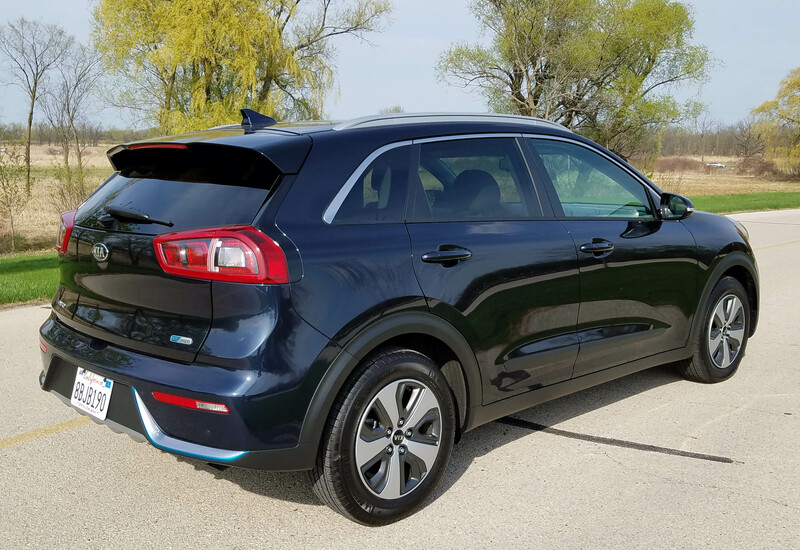 Now Kia ups the proverbial ante by offering a plugin hybrid Niro and I tested its top-shelf EX Premium model decked out in Gravity Blue, a dark metallic blue that looked black until exposed to sunlight, a rarity in Wisconsin this spring. This Kia hatch, which looks suspiciously like a crossover, but only offers 2-wheel-drive, is the perfect commuter. It delivers stunning gas mileage. Well, hang on … wait for it … I got 84.1 miles per gallon. Take that you $3 per gallon gas prices! How’s it do this? Well, like others such as Chevrolet’s Volt, the Prius and sister car maker Hyundai’s Ioniq, the plugin system gives Niro enough electrical juice to get most folks to work, and back, on a charge. Pull the Niro into the garage and plug it into your standard wall outlet via its special charging unit and heavy-duty cable. Wait 10-12 hours and voila, you have a 26-mile charge. A 240-volt charger is available too, giving a full charge in less than three hours. My commute is 12 miles each way, so I had electric power to and from work, plus enough to run up the street for lunch. In fact, on one charge I managed about 32 miles on the charge. Nice when you can exceed the mileage the dash gauges are promising you. Niro, like Volt, uses a gas engine to recharge the batteries when the initial plugin charge has been depleted. It’s a great system in that you never notice any switchover from electric to gas power because, really, it’s always smooth and torque-heavy electric power since you’re always working off battery power with the electric motor powering the front drive wheels. For the record the car uses a 60-horse electric motor powered by lithium ion polymer batteries and a 1.6-liter I4 with 109 hp generating more power once the initial charge is done. Regenerative braking also keeps adding power to the batteries as you coast or brake. That’s what extended that 26-mile charge to 32. The benefit of this system as opposed to a pure electric car, such as Nissan’s Leaf, is that you could drive from here to anywhere and never have to worry about fuel sources, charge time, etc. Now if Niro were just a cheap-feeling econobox one could pooh-pooh it as a gimmicky set of wheels aimed at pleasing government regulators. But Niro is much more. First, it feels bigger than it is, although it rides on a 106.3-inch wheelbase, similar to many compact to mid-size vehicles. It feels solid too and is loaded with safety and comfort features. Handling is light and easy, plus with its battery load the car has a low center of gravity, making it a dream on sweeping curves. I found myself taking some turns faster than I even dared in some small sport sedans. Ride, as alluded too with the wheelbase comments, is fine. Like many cars the ride can become a little choppy on heavily pot-holed roads, but the ride never become sharp or disturbing even on Milwaukee’s far northwest side roads, some of which make the moon’s surface look relatively smooth. Braking is quick and efficient too and there’s both stability control and hill-start assist to keep the Niro from any backward movement when starting on a steep incline. 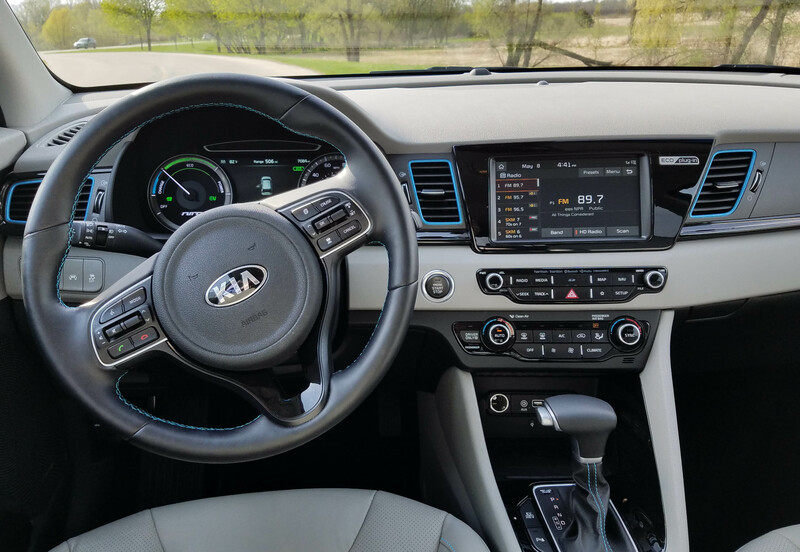 The test car’s interior featured light gray leather seats with bright electric blue stitching and similar blue trim around all the dash’s air vents. Sharp! The dash has a dark gray top, gloss black center and black lower portion. There are gloss black inserts by the sharp 7-inch touchscreen and more on the console. Everything is well laid out and easy to both reach and understand. That touchscreen is simple to use and find and change radio stations. Preset buttons are along the screen’s side and there are small volume and tuning knobs to boost the sound via the car’s Harman-Kardon speakers. The dash also features big buttons for the dual climate control system. The steering wheel is a manual tilt/telescope model with smart cruise control, a trip computer and radio controls on the hub. Niro even allows you to fold the power side mirrors flat to the vehicle for those times when you’re in tight parking quarters. Seats are power with a power lumbar support and two memory settings for the driver’s seat. The seats offer mild hip support but better lower back support and you can fit four adults in the car if none are extraordinarily tall. Headroom is generous. The console features buttons for a heated steering wheel that heats quickly, and both heat and cooling for the front seats. Likewise there are plenty of 12-volt and other electronic hookups available in the cubbie under the center stack, so it’s easy to plug in a phone, iPad, etc. Overhead there was no sunroof, but there was a sunglasses holder that folds down from the roof and the sun visors both flip to the side and slide to block side sun. 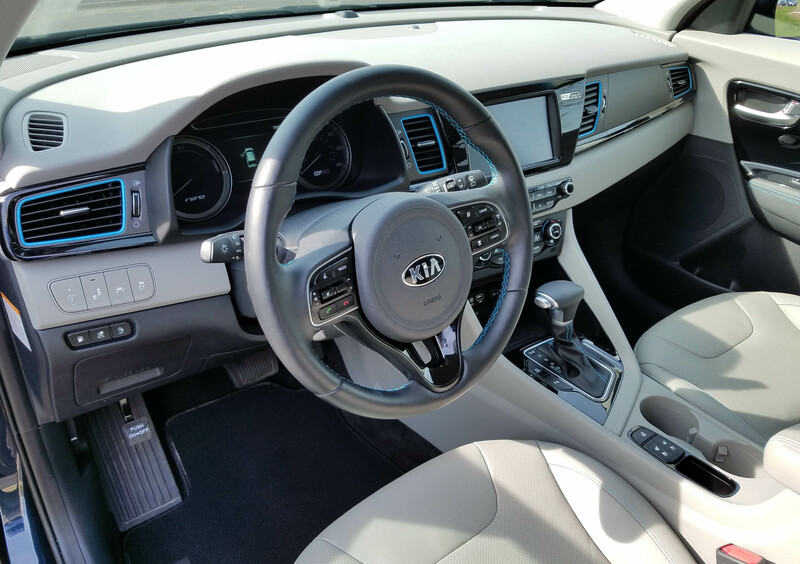 On the safety front Kia delivers with a blind-spot warning, smart cruise control, lane departure system and a backup camera with rear cross-traffic warning. There’s also an emergency braking system that brakes the car if it detects something in its path. Because this is a hatchback there’s a hatch that opens wide for easy loading and the Niro’s rear seat is split and will fold flat to boost cargo room. I also like that there’s a rear window wiper to clear off snow and slop during the dismal months. Now back to the wow factor, the gas mileage. 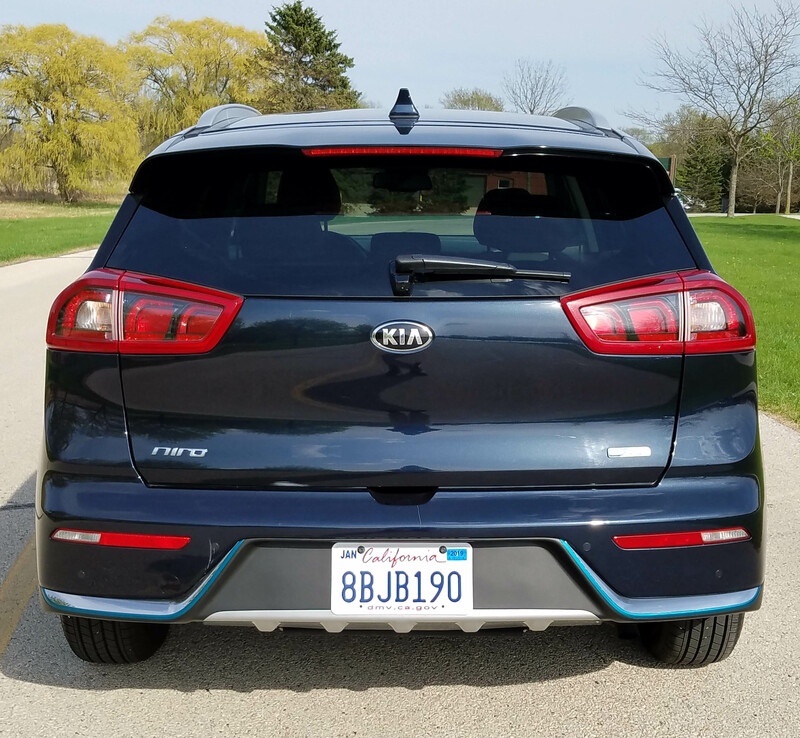 The EPA rates the Niro at 105 mpg using electric and gas power, and 46 mpg when only in gas mode. The snazzy test vehicle was the Premium model, starting at $35,440 including delivery. With just one option, carpeted floor mats, the test vehicle settled at $35,575. That’s very near the average price for a new car these days. But here you get smooth and quiet operation, a full complement of safety equipment and superb fuel economy. 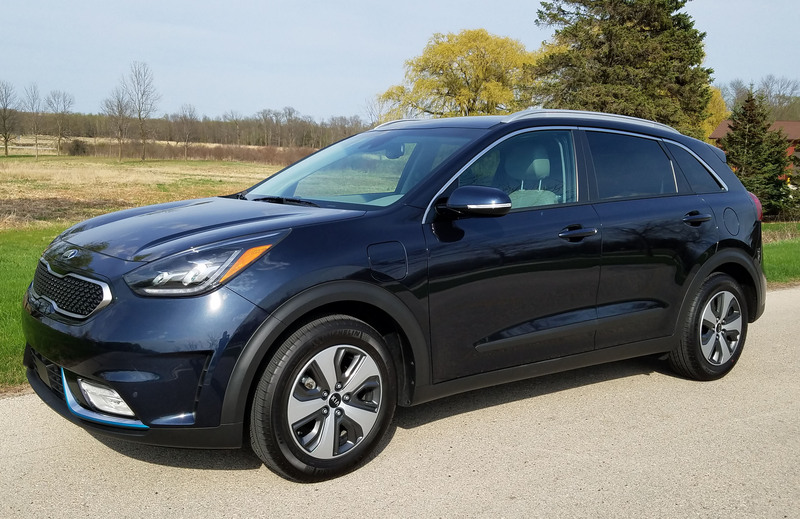 If you need to spend less, the base LX plugin hybrid goes for $28,840, while a base Niro FE model starts at just more than $24 grand. It’s like last year’s tested hybrid, but not a plugin, so good, not great gas mileage. Oh, and Kias still have a 100,000-mile or 10-year powertrain and battery warranty. 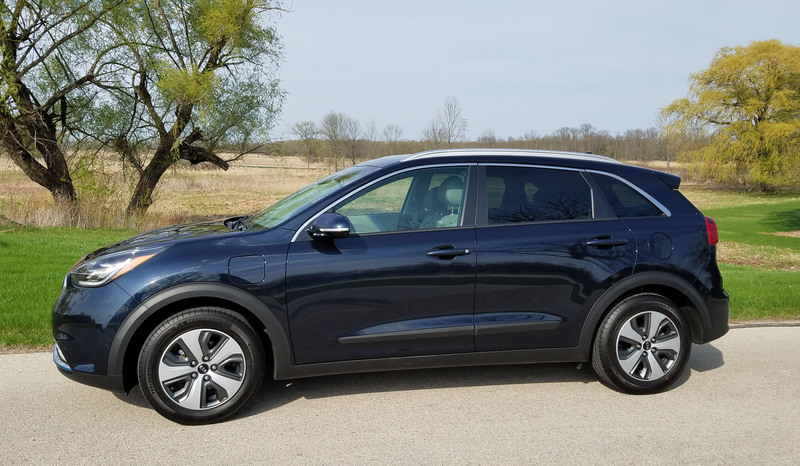 Do yourself a favor and give Kia’s Niro a look. Misses: Mild acceleration when gas engine engaged.